Spread the cost of a new mobile phone into smaller, easier payments. Pay for your new phone in easier, more manageable amounts. Our affordable phone prices keep your payments down. Our phones are unlocked, so you can insert any compatible SIM. Checkout with your phone and you’ll be redirected to Close Brothers payment site. See an overview of your instalment finance, then finish the quick application. When your application is accepted, we’ll send your phone via free delivery. As soon as your phone arrives, you can insert any SIM to start using it. In a nutshell: Buying a mobile phone on instalment finance lets you spread the cost into low and affordable monthly payments. Finance is basically a more flexible way of paying for a new phone. And because our SIM-free phones are unlocked, you have the freedom to use any SIM card. Who is the credit provided by? We work with Klarna to offer all our customers the best credit rate available. Finance is provided through Klarna's platform by a number of lenders, and you get told who your lender is when a loan is offered. It’s simply when a credit lender looks at your credit report. The lender does so to see how well you manage your credit, past and present. A credit search may be recorded on your credit report for third parties to see. Should I apply for credit/finance? If you think you’re in a position to apply for a phone on a network contract, you should be fine for a finance one. By Direct Debit, straight from your bank account. You just provide the relevant account details when applying for one of our mobile phones on finance, and the monthly instalments will typically start one month after the date of the finance agreement. Yes, at the point you apply. The deposit is calculated at just 15% of the phone’s SIM free price. Our finance option works over 24 months, meaning you can spread the cost into smaller, more affordable monthly payments. What are the Terms around mobile phone finance? Our Terms can be found in our Help section, along with more information around our mobile phone instalment finance option. 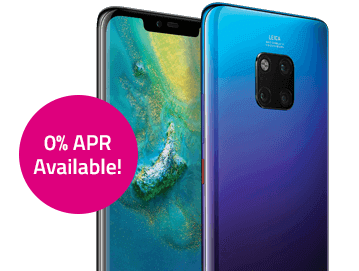 Interest free credit (0% APR) applies to mobile phone finance on Huawei P20, Huawei P20 Pro, Huawei Mate 20 Pro and Huawei Mate 20 X. Offer is subject to acceptance on a 24-month finance agreement with a 15% deposit.